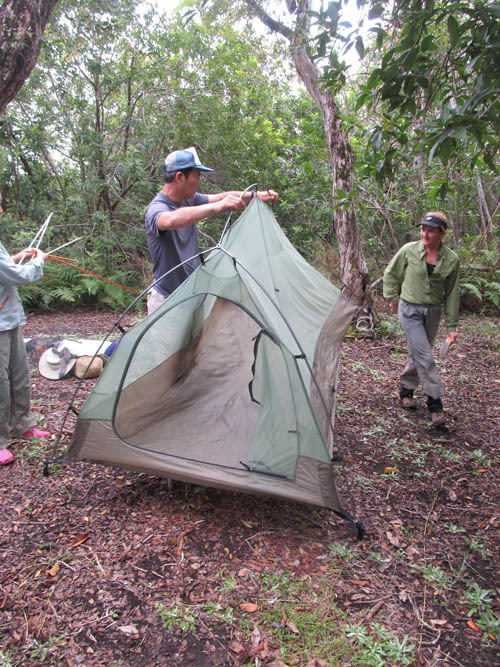 On the third and final day of our camp-out we backpacked from the Mokuleʻia Forest Reserve along the rim of Makua Valley to return the way we had come on the Kuaokala Trail. It was a cool and overcast morning as we gathered at the hunter’s shelter for our final breakfast. Since I brought way too much food, I eagerly pawned-off oranges, miso soup, nutella and peanut butter crackers to my fellow campers to reduce my load on the return leg of our trek. After filtering water from the stream, breaking-down camp, and packing up, we reluctantly bid farewell to our campsite and pushed-off for the almost 7-mile return trek to the Kuaokala trail head where our cars were parked. 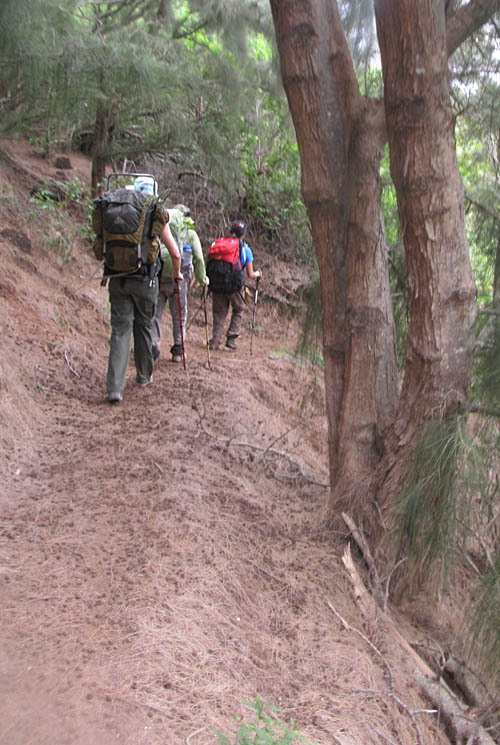 While following Jeanne along the fence line, I enviously eyed the blue backpack she constructed herself — which weighed an incredible 14 pounds on the return leg — as I lugged my 60 pound backpack up and down the rim of Makua Valley. 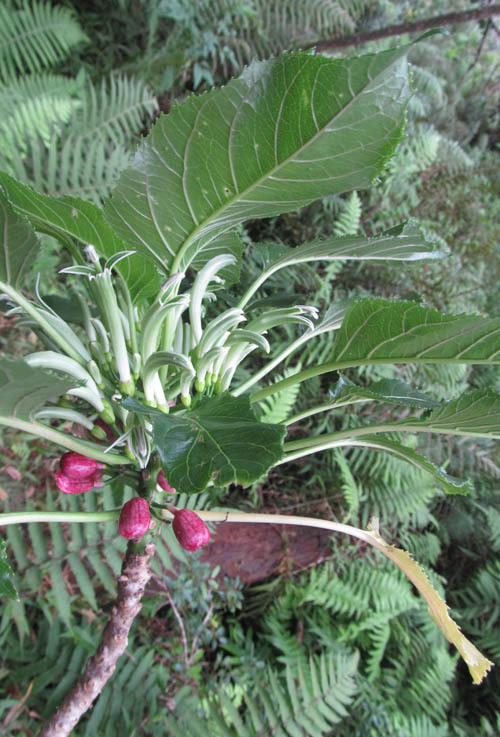 When we reached an obscure side trail, I veered-off to to visit a population of rare ʻoha (Delissea subcordata) which is in the lobelia or bell flower family of plants. The plant had a single long stalk that stood about 5 feet off the ground with a shock of leaves on top. We were pleased to see the plant with flowers and fruit! The flowers were about 2-1/2 inches long and were green in color outlined in white. They also had cute little red fruits from the previous time the plant flowered. 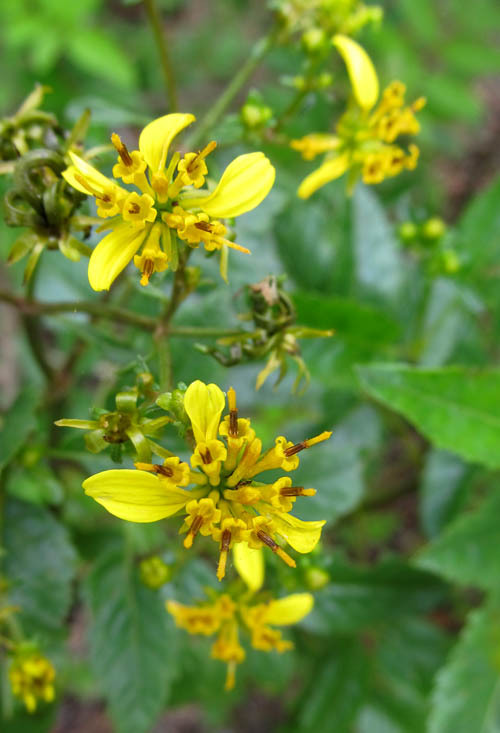 The plants are endangered and only a few dozen plants remain in the wild. 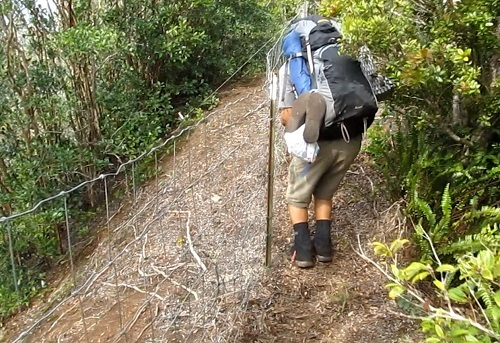 Returning to the rim of Makua Valley, we pushed onwards where we sometimes had to squeeze between the fence and vegetation. Those with streamlined packs slipped through effortlessly, while other with bulky packs struggled to force their way through. 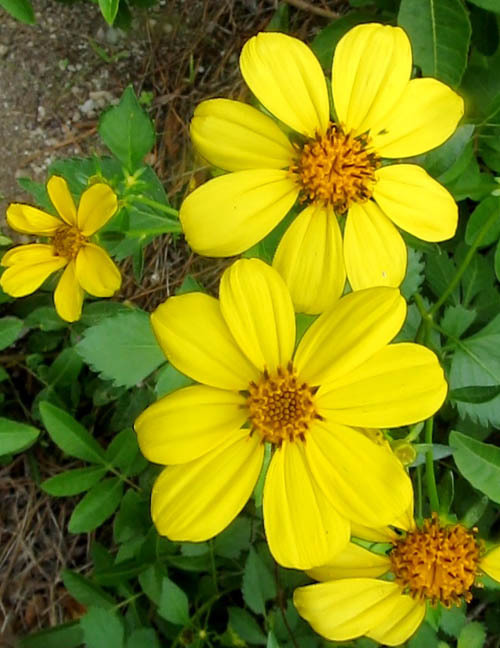 We were thrilled to see a number of different varieties of koʻokoʻolau (Bidens sp.) in bloom along the rim of the valley which have compound flowers — a flower head made up of many small flowers appearing as a single bloom. 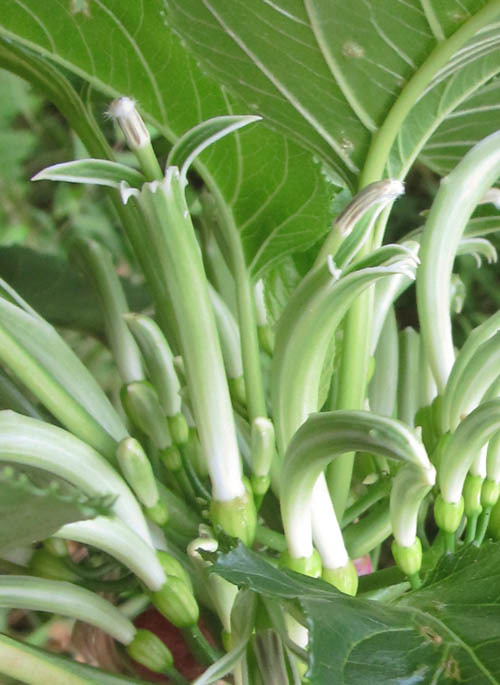 This particular variety of koʻokoʻolau has smaller flowers that are more spread apart making it easier to see the individual flowers that comprise the flower head. While examining the flowers close-up, I was thrilled when a Hawaiian Blue, also known as the Koa Butterfly or Blackburn’s Butterfly (Udara blackburnii) landed to sip nectar! This is one of only two butterflies or pulelehua — that are endemic to Hawaii. The butterfly is small — only half-an-inch across — and the backside of its wings are a beautiful turquoise color. 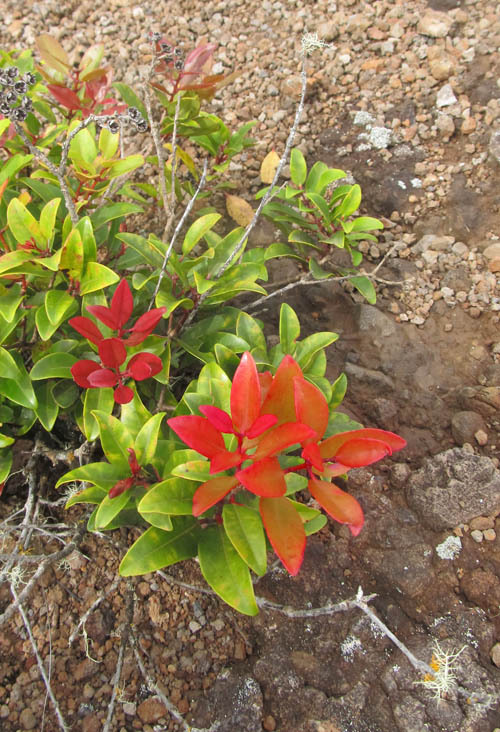 Some of the most vibrantly colored liko lehua — the young leaves of ʻōhiʻa — live along the rim of Makua Valley. 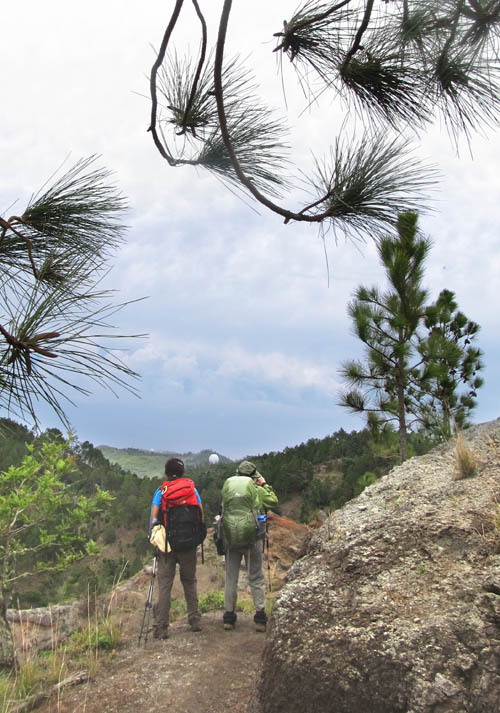 We lingered for quite some time admiring the foliage and the view of the valley before continuing on. 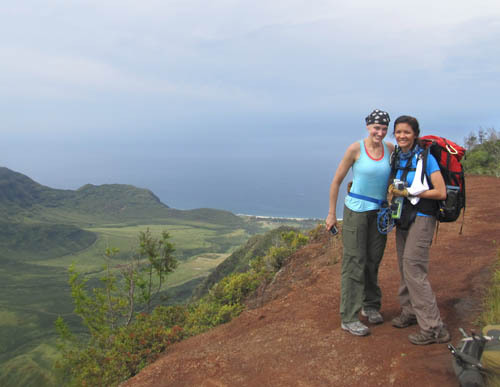 Dark clouds began to gather over Makua Valley as Jill and Grace pose along the edge before we veered-off to descend a series of switchbacks. 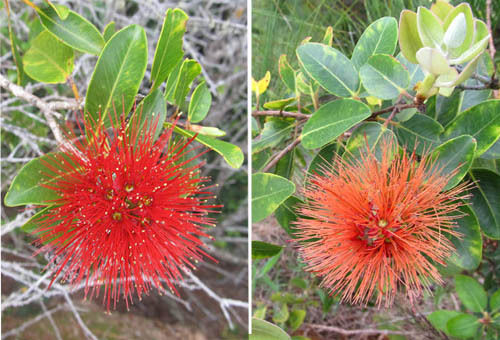 One of the cool things we saw on the Kuaokala trail were the red and orange flowers of ʻōhiʻa lehua which are one of my favorite things to photograph. 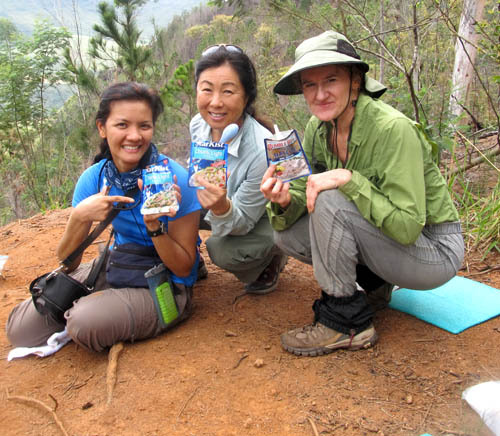 The old adage — great minds think alike — came to mind when we discovered that Grace, Jeanne, and Karen all had tuna foil packs for lunch — a popular backpacking food. 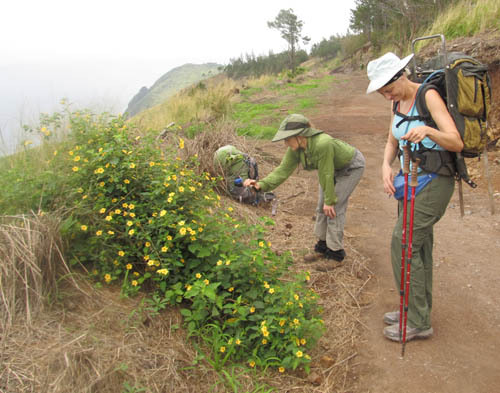 When we reached the Kuaokala Trail, even more low-lying dark clouds began to blow in but we stopped to marvel at a shrub of mountain ʻilima (Sida fallax) with many flowers in bloom. 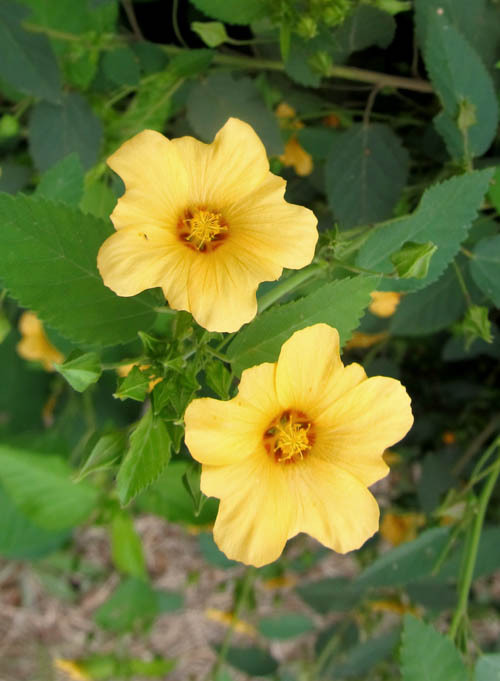 The yellow-orange ʻilima flowers were about three-quarters of an inch across with a tinge of red in the center. A number of bees, butterflies, and other insects were attracted to the flowers and hovered about to sip their nectar. While hiking through the pine trees on the Kuaokala Trail we saw the communications center off in the distance and we were pleased that our almost 7-mile trek was nearly over and that we could sleep in a nice warm bed that night. After rounding our way through a grove of iron wood trees, we were all smiles when we emerged at the Kuaokala Trail head! Many thanks to Larry Lee for coordinating the backpacking trek and to everyone who attended for making the camp out so much fun! While driving down the mountain and along the Waiʻanae Coast, the skies grew darker and began to rain when I reached Kapolei. As we made our way through the down pour, I reflected on the fun times we had at backpacking in the Mokuleʻia Forest Reserve, seeing rare native plants and animals, and getting out just before the rain storm hit! What a great camp-out! Great stuff Nate. Yeah, the butterflies certainly are out right now. 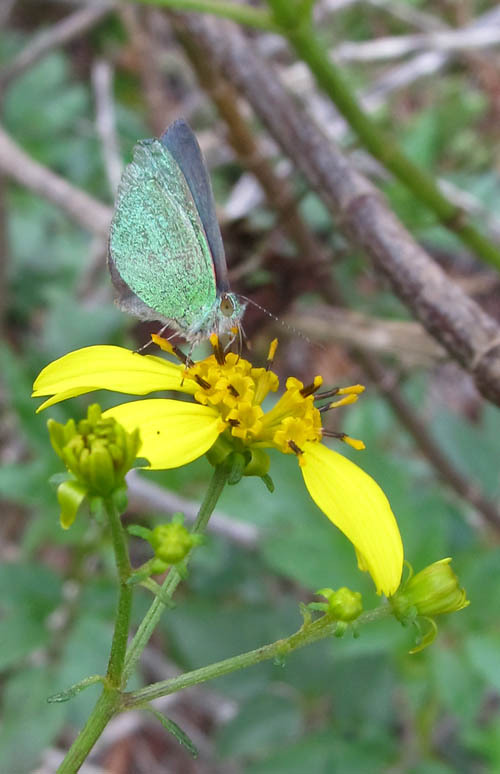 Here’s a similar shot of a koa butterfly on Bidens we took this past weekend on Maui. Great write up Nate. Wonderful picture of the koa buterfly. Thanks so much for sharing. You’ve inspired me to consider try camping. Nate, I loved the picture of the butterfly! All your pictures are good but that one just made me go WOW! I continue to enjoy your posts, thanks. Sweet capture of the Hawaiian blue on the B. torta Nate! The first Ko’okolau shot… is that B. amplectens? Like how your butterfly on flickr’s in the sun so you can see how irridescent the wings are — very cool! Thanks Carren — the Hawaiian Blues are indeed cool.